You might look down at your coffee and think, “there is no way there is mold and bacteria in that cup, my kitchen is too clean”. However, a National Science Foundation (NSF) study might convince you otherwise. A research study from the National Science Foundation (NSF) found that in all the rooms of an average American household, the highest concentration of germs is found in the kitchen. Even more disturbing is the fact that the coffee maker is the fifth dirtiest item in the household, nudged between the pet bowl and bathroom faucet handle. The above mentioned NSF report notes that approximately half of coffee reservoirs have mold and yeast in the reservoir with 10% exposed to coliform bacteria. The medical journal, Scientific Reports, reports that coffee makers are an excellent environment for bacterial growth. The scientific report specifically mentions standard capsule coffee machines and says that leach from standard capsule machines is a rich substance for bacterial growth. The medical study also identified disease causing bacteria in coffee machines. The researchers strongly suggest the need for frequent maintenance of coffee machines (and more specifically capsule coffee makers). Why Coffee Makers are Full of Mold and Bacteria? You might be asking how such a commonly used appliance has widespread bacteria in the U.S. beyond the knowledge of coffee drinkers. It’s the resistance of the body to the germs that keeps us from realizing we’re ingesting potentially harmful substances. Over time the body can filter out the infected areas of your coffee pot, but some medical experts state that the contamination can eventually slip by the immune system and leave a coffee drinker sick. Many people think that the hot water that runs through a coffee maker is enough to kill off any infection in the kitchen. There’s also the assumption that coffee’s natural antibacterial properties are enough to ward off mold and bacteria. Sadly neither of these are completely true. In order for water to kill bacterial organisms it needs to be above boiling temperature, which no household coffee maker reaches. Also, the acidic antibacterial function of roasted coffee can only eliminate about half of the germs in the pot and filter. As a matter of fact, it’s the moist conditions brought on by the heated water that makes the pot a breeding ground for bacteria and mold. At this point the main solution seems obvious. 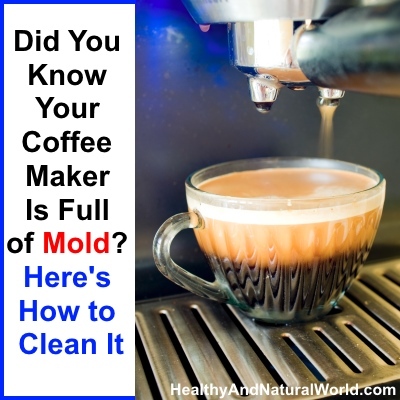 If you aren’t already cleaning your coffee pot on a regular basis, it is probably worth your time — unless you enjoy mold in your daily cup of coffee of course. To get a real effective clean, however, you’re going to have to do a lot more than splash a bit of water around your carafe to rinse out old coffee. First consider how often your pot gets used. This will give you a better idea of how frequently you should wash it. For the average coffee drinker that brews approximately one pot daily, it’s probably best to give your machine a decent weekly wash. If you brew more often, like in a work environment or with a large family, consider biweekly washings. Make sure you take all of the removable parts of the coffee maker out to wash each time. Use hot and soapy water to thoroughly wash the filter basket, carafe and any other removable parts of the machine. This initial wash will remove stains, most germs and stubborn residual oils. Allow the parts to air dry completely before placing them back in the machine. But don’t stop there! There’s an additional trick to completely flush your machine of foreign minerals and bacteria: vinegar. Even daily washes with hot and soapy water won’t completely clean the coffee machine. There is mineral build up from standard tap water and stubborn germs that like to stick around after washing. This following vinegar washing technique is recommended at least once every month to decalcify your machine and ensure the purity of coffee in your household. To start, fill your coffee maker’s water reservoir with half water and half white vinegar. Place a paper filter in as if you were going to brew coffee, but obviously don’t put coffee in it. Let the coffee maker brew until about half of the water has emptied into the pot and turn in off. After about a half hour, turn the coffee pot back on and allow it to finish brewing. Now you can replace the filter and run a batch of plain water through the machine to rinse it out. Most people recommend doing this step twice to make sure the vinegar is completely rinsed. Complete the process with a soapy water rinse like you normally would on a weekly basis. You can use the vinegar for other things at home as mentioned in my article about 10 surprising household uses for vinegar. Now that your coffee pot is clean and ready to go, you can enjoy a steaming cup of coffee with a peace of mind. Coffee mugs can also accumulate bacteria like many other dish and drink ware in the kitchen, so make sure you are careful to thoroughly wash them as well. You shouldn’t have to worry about mold when it comes to the number one source of fuel for the working American, and with vinegar and a bit of effort you don’t have to. Vinegar is also a good and safe alternative to bleach. Find below the top 8 natural bleach alternatives: Top 8 Natural Bleach Alternatives. Related article: Warning Signs of Mold Illness. So what if you don’t use paper coffee filters (uses a reuseable filter) how does the cleaning take place? We have a coffee maker at work with a permanent filter, my supervisor uses it daily where myself and another employee will not use it. The filter has not been washed or rinsed out in over a year, he dumps the used grounds in the trash and adds more…usually there are still grounds stuck to the filter. This cannot be healthy. i wash my pot and filter with hot soapy water every day. in addition, i wipe the top of the coffeemaker, where they water comes out, every day. most importantly, i leave the lid open to dry the inside of the coffeemaker. i doubt they’d find any mold in my coffeemaker. i also leave the lid open on my washing machine after each load to dry. no funky smells in my washer! thanks…tried that…still moldy….I’ll try straight vinegar and hope it works.